The first day back on the bikes was another detour fest which eventually ended on Telephone “road”, a tractor path through some beautiful rolling hills. We found a random Calf who was stuck on the wrong side of the fence and he was so scared of us that he jumped through a barbed wire fence to get back on the other side. Eventually, we decided to camp on the road in some beautiful country and had the howling wind and phenominal stars to keep us company. Canned tuna and rice… standard dinner. The next day was a big day of riding, 69miles total! We don’t typically do a lot of miles per day, we are more in it for the experiences and serendipitous events like spending the night at a winery. 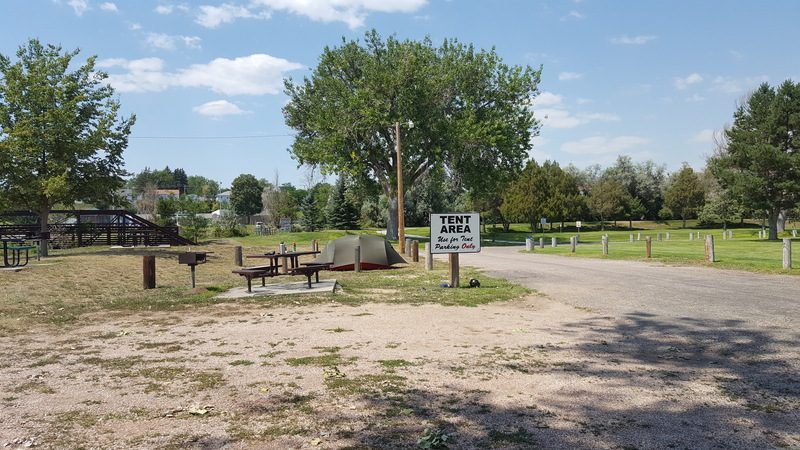 After rolling to Chugwater, WY pop 212, we grabbed some chili dogs at the only place in town and met some less than kind locals who made it a point to speak loudly about how people travelling for the eclipse better stay the hell off their land. We originally planned to stay in Chugwater but instead rode another 30 miles to Wheatland. Along the way, we finally learned what the mystery fences were… Snowdrift fences. The ride from Chugwater to Wheatland was tough, there was some serious wind and not much in the way of scenery. We passed some interesting compounds that were a mystery. Originally we thought they were old rodeo rings, but then realized they were old underground bunkers for ICBMs. There were constant Huey helicopters flying around taking the crews to the remote locations to sit alert waiting​ for WWIII! We were dead tired and got caught in a big wind storm that knocked Lauren off her bike. Also it caused a giant coal cloud to blow in front of us from the power plant. Eventually we rolled into town and had some great dinner and brews at Windy Peaks. Our bartender Stevie was awesome. We talked all night and decided to go back the next day to get some more info from her and plan the trip up the mountain. We camped for free in the local town park which had a few spots for RVs and a couple of tent sites too. The next day we found out the park was closed for camping so they could charge for the eclipse, but the guy who took care of the park was cool and said we could stay for free. We hung out in the park and hit up the public pool that was 200 yards away. We did cannonballs off the high dive and rode the water slides because, why not!?! It was a pretty relaxing few days. By the time we left Wheatland, we were the talk of the town. At breakfast on the way out of town, the waitress asked if we were the folks riding bicycles up to the eclipse. There were a few bad apples who clearly were not interested in people visiting their town from out of state. One guy at the liquor store said “I heard folks from Colorado were emailing ranchers saying, we are gonna camp on your land and there is nothing you can do about it!” No… no that never happened. There were some dipshits, but we met kind folks as well. Stevie offered to drive us up the mountain but we politely declined and explained that the whole point of the trip was to ride. When we got to the summit we realized why she offered.